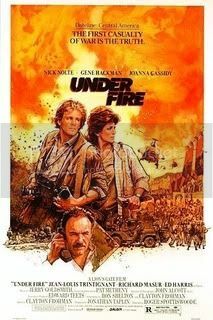 "Under Fire" is a fantastic film starring Nick Nolte, Joanna Cassidy, Gene Hackman, Ed Harris, Alma Martinez, and Jean-Louis Trintignant. This compelling story takes place in 1979 involving a famous war photographer Russel Price who's covering the civil war against president Somoza in Nicaragua. The cruel revolutionary fighting causes it to become difficult for Price to stay neutral on the war. When the Guerillas have him take a picture of the leader Rafael, who's believed to be dead, he gets drawn into a dangerous dilemma. "In twenty years we shall know who's right." Obviously, this is an embellished story for the purpose of making an intense emotional journey of a film.. but I've always enjoyed this movie and felt it gave you a glimpse into the dangers that journalist face when covering a war. 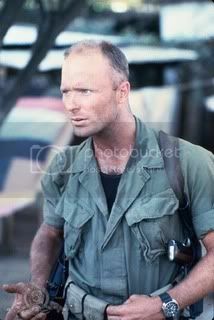 Ed Harris is brilliant as the mercenary without a conscious. War is evil and it is hard for me to sit here and like his character, but it did add an entertaining element to the film. "Under Fire" is a movie that I seldom watch.. but I have to say it is worth the emotional journey at least once. I own Under Fire vhs tape but the last time i watched this was about 20 years ago. I do remember that it is a very good movie. It´s a very good movie dealing with a difficult subject. Love the cast, you care about the characters and they really trashed those Mexico streets. This movie takes the sandinistas side and makes the dictator Somoza the evil. 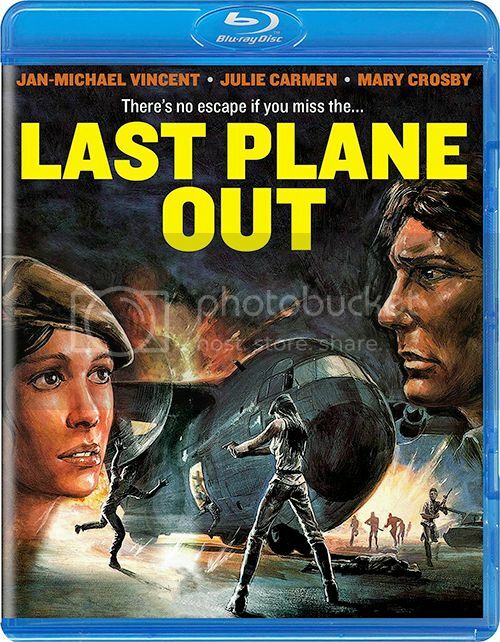 Then i watched another political film set in the last days of Nicaragua civil war called Last Plane Out (also 1983). This low budget movie stars Jan-Michael Vincent, Julie Carmen and Mary Crosby. It was based on journalist Jack Cox's (who co-produced the film) experience in Nicaragua and he falls in love with a pretty Sandinista rebel. Last Plane Out favors the government and Somoza so it was exciting to see both sides of the story. Under Fire is clearly better film and i would recommend LPO only for fans of early 80s low budget war/action stuff. Like Johnny said earlier on another thread, blu-ray out next month. Back in the day, the distributor handed out actual matchboxes with Under Fire artwork to promote the VHS rental video. It's black and yellow, with original artwork on the front and the Orion Pictures logo on the back. I never could throw it away, so i actually still have it today ! It may very well be the last remaining copy on the planet ! I doubt it's worth anything, but it's still a reminder of how creative distributors were in those days. Cool! Gotta love the original Drew Struzan poster. You can feel the twin films syndrome here, eh? Here in Holland, the Under Fire rental-tape came with different artwork though. Only pic (from Ebay) i could find with this artwork, but this is the same as printed on the matchbox. Ok, interesting. Never seen that one. Thanks for bumping this thread. I had first seen "Under Fire" back in the 200X's, on DVD. Excellent period piece, with a solid story & great acting by Nolte, Cassidy, and Hackman.